Ever wondered how to get ink stains out of clothes once you’ve found them? Here’s help to get rid of even old stains. I also use this method to treat ink stains on the lining of my purse when I forget to put the cap back on my pen. 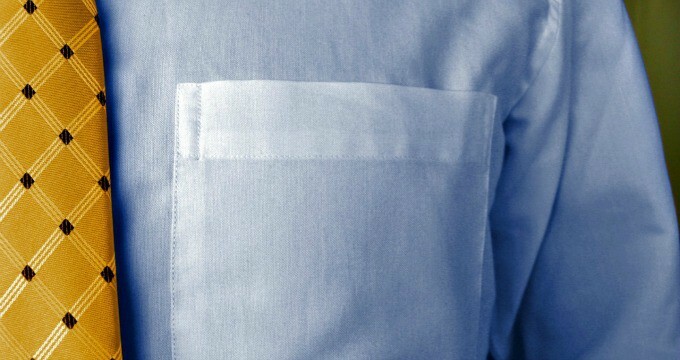 Unless you’re a person who never forgets to put the cap back on the pen or you like the look of a pocket protector, you need to know how to get ink stains out of clothes. It’s happened to all of us. Just the other day I tucked a ballpoint pen in the pocket of my favorite pink hoodie without putting on the cap. Sure enough, I found an ink stain on it when I was doing the wash.
My family is prone to ink stains, so I keep the ingredients below on hand. Now you’ll know what to keep in stock, too. Ink isn’t just coloring — it’s an oil-based dye delivery system. That means you’re not removing the dye — you’ve also got to tackle the oil-base, too. The type of chemical bond between the ink and your clothing depends on whether you’ve laundered the item. As with most laundry stains, it’s easier to get ink stains out of clothes when the spot is fresh. That’s why your grandma inspected every item of clothing as she dropped them into the machine. Life is a lot busier these days, so if you can’t make inspecting clothes part of your laundry routine, don’t fret. I don’t know too many people who take such pains before doing the wash. I keep a stain treatment stick tied to my laundry hamper to treat stains as I get undressed. But ink stains need more than just a stain stick, especially old ink stains. It used to be that you could use hairspray to remove ink, but modern hairsprays tend to be low-alcohol. Know what does have a lot of rubbing alcohol in it still? Hand sanitizer! So, in a pinch, give it a try. Just remember that added fragrances, moisturizers, and colorings may make the problem worse. When dealing with new ink spots, the dye’s oil hasn’t had a chance to bond with your clothing yet. That makes it much easier to get ink stains out of clothes when the spot hasn’t chemically bonded to the fabric. 1. Blot up as much ink as possible. To do this, use a paper towel or old white rag and press against the ink stain. Lift the cloth, rotate it, then use a clean area to blot the stain again. Repeat this process until you can’t get any more ink out. It’s important not to rub or wipe while you’re doing this or you may cause the stain to spread. 2. Place the stained part of the clothing flat on an old towel or brown paper bag. Dip a clean cloth into rubbing alcohol (surgical spirits in the U.K.) until it’s wet and dab the stain. As before, rotate the rag, so you’re always using a clean section. Again, don’t rub or wipe or you’ll risk spreading the ink — the goal is to transfer the ink from your clothing to the rag. 3. Once you’ve done your best dabbing the stain, launder it on the hottest setting the fabric can handle. After washing, make sure there’s no stain left before you transfer the item to the dryer. 4. 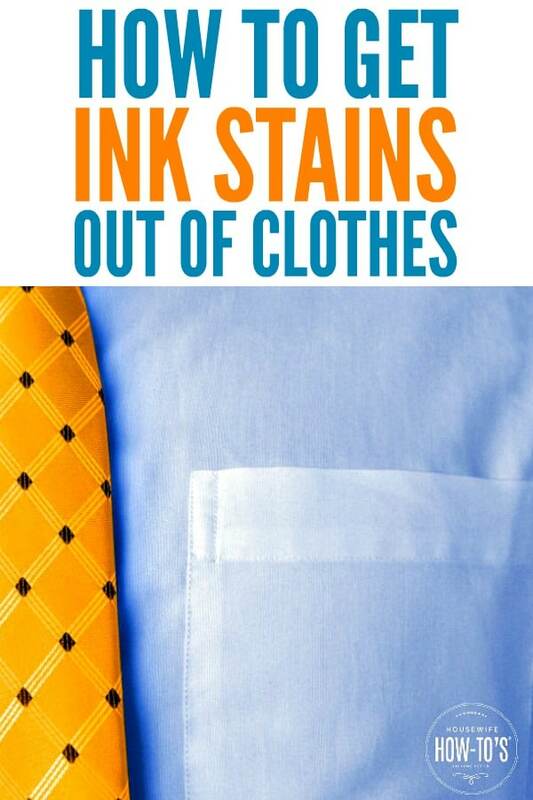 If the stain remains, try the method below to get ink stains out of clothes. Getting an old ink stain out of clothes is more difficult because by this point the oil-based part of the dye has chemically bonded to your clothing. It’s still possible, though. Here’s how. 1. Try the method above first — it often removes even older ink stains. 2. If the stain persists, head to the pharmacy (or the healthcare section in your grocery store) for a bottle of plain glycerin. Glycerin is made from animal fat and vegetable oil. It helps dissolve the oil-based bond because, chemically, like dissolves like. While you’re there, pick up some non-chlorinated, oxygenated bleach (e.g., OxyClean). 3. Make an ink-dissolving paste. Combine one tablespoon of glycerin, one tablespoon of oxygenated bleach, and one teaspoon of liquid dish detergent in a small bowl. I use Dawn Original for the liquid dish detergent because it’s fantastic at cutting through the oil-based grime. 4. Dip a cloth into the mixture and dab both sides of the stain. Let the paste sit for 5 minutes then launder in the hottest setting permitted by the manufacturer label. Inspect the item before drying and repeat if necessary. No laundry facilities at home? If you live in an apartment or don’t have a washer and dryer available for immediate use, you can hand-wash the item after step #4. Alternatively, pop it into a clear plastic bag (not an old shopping bag, which has dyes that might transfer) and stash it in your freezer until laundry day. Since it’s much easier and more efficient to get ink stains out of clothing when they’re fresh, you might want to consider keeping a bottle of colorless hand sanitizer in your purse, desk, or car. It’s alcohol-based, so you can treat ink stains with a dab of hand sanitizer and tissue the instant they happen. It’s easier on clothing, too! I needed these tips! Thanks for linking up at the Meet Up Monday Link Party! Hope to see you again next week! I love your link party, Tara. Thanks! I need to try this. My husband is great for getting ink stains on his shirts. I can’t tell you how many shirts I have thrown away. I used to throw out too many, too, Bev. Hope you find this useful! I have this ridiculous habit of crossing my arms while holding a pen at work. You wouldn’t believe how many times I’ve come home with ink on my clothes. Thanks for the tips. I found your site through the Artsy Fartsy Link party, great list of “how tos”, I’ve always wondered how to get old ink stains out of clothes! Pinned and stumbled! What great tips! Ink stains are some of the most frustrating for me. I can’t wait to’ try these out! Thanks so much for linking up and sharing at Celebrate It! I hope you find them helpful, Teri! So interesting and useful! I have a few things that could use that! Ink stains do seem to be common, don’t they? Thanks for this info and the tips on removing ink stains. I have a son that is a waiter and sometimes leaves a pen in his pants pocket – what a mess. I read in my stain book about the alcohol and that did work some but didn’t know about using hairspray or the other stain mix you mentioned. Pinned the info so I can refer back if I need it again. Thanks for Pinning it, Kimberlee. I hope it helps! Absolutely love these tips! Thank you! I just got black pen ink on a pair of cream/gold threaded pants in court yesterday and almost cursed out loud. I will be trying these…your post is right on time. I can do all of the steps above except for hottest water due to I have colored shirts & they will shrink in hot water, so will this work with cold water?